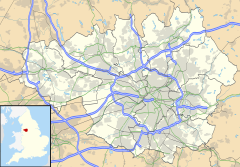 Salford (/ˈsɒlfərd/) is an area of Greater Manchester, England, west of Manchester city centre in a meander of the River Irwell, which forms part of its boundary with Manchester. ^ Census 2001 Key Statistics – Urban area results by population size of urban area, Office for National Statistics, Government of the United Kingdom, 22 July 2004, KS06 Ethnic group , retrieved 5 August 2008Retrieved on 5 August 2008. This page was last edited on 25 April 2019, at 06:15 (UTC).